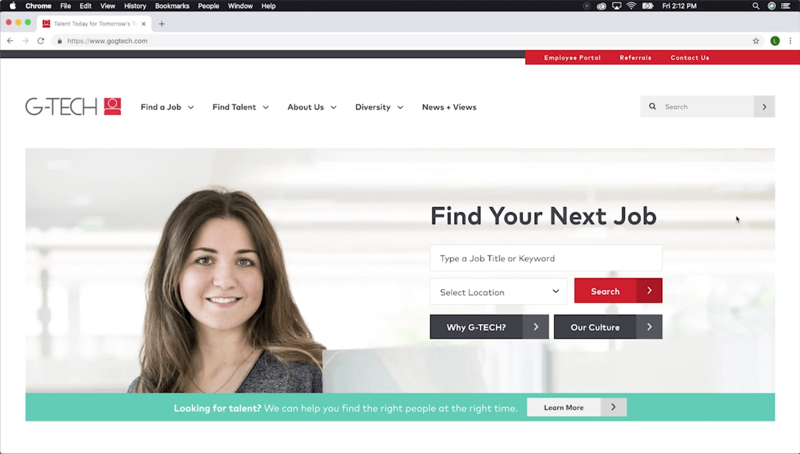 G-TECH came to TM in need of a brand new website that would act as a marketing tool for their brand, help job-seekers get connected with the right staffing individuals, and share information about their culture and diversity. The website's design was very important to G-TECH, as it needed to showcase the fact that they are leaders in their industry, as well as extremely professional and streamlined in their approach. 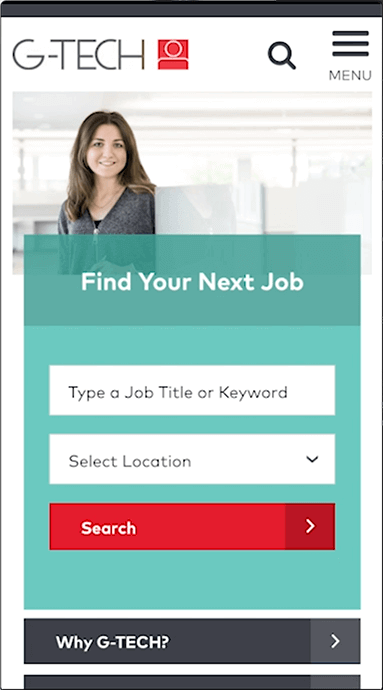 Integrating the website with G-TECH's internal job posting system was also on the docket, in order to better assist their clients and create a functional user experience all around. G-TECH had recently been through a website build for their parent company, so they already had a good idea about the build process - and how much effort it takes to write great content for a new website. In order to achieve all of G-TECH's goals, the project would be a partnership from beginning to end. TM got right to business meeting with G-TECH's team, discussing needs, timelines, and proposing ideas. TM then designed a very streamlined website by highlighting G-TECH's red and green brand colors, both of which pop against the sleek whitespace that was also used. While the rest of the website was being built, TM's copywriting team assisted G-TECH in writing and editing content, firmly deciding on the website's navigation, and crafting various CTA's on each page. Our developers also made sure to integrate the website directly into an internal system that G-TECH utilizes to manage all of their job postings. The resulting website is a gorgeous example of TM's design abilities and just how well a project can turn out when all parties work together to get the job done. We are very proud of this website, and we know that G-TECH is too! 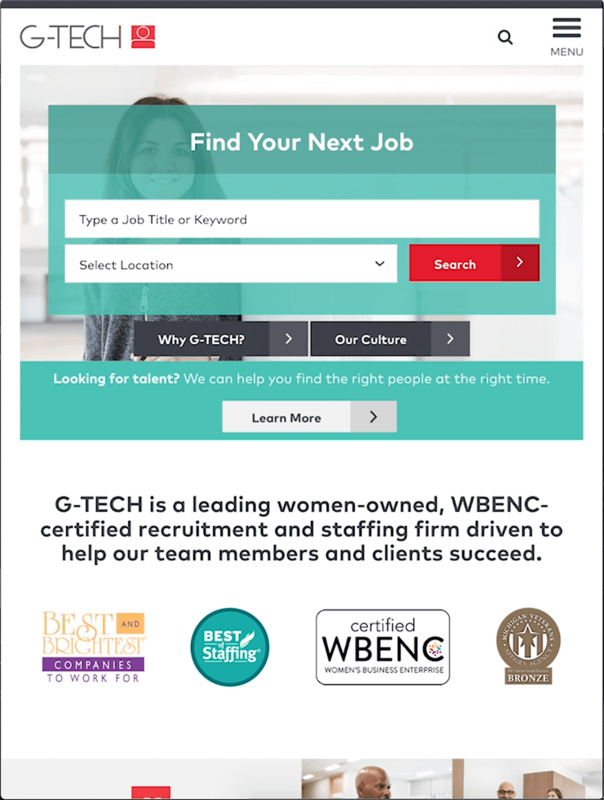 An important part of this project with G-TECH was to integrate directly into an internal system that they utilize to manage their job postings. We constructed a connector to directly pull data. This ensured that each listing generated on the new website was in-sync in real time, as well as allowed for people to search the internal system's information via the website. For G-TECH, it was incredibly important to have a consistent and impactful design and online presence. Working with their internal marketing team, TM ensured their brand was properly represented, photography was ideally selected and placed, and that brand messaging had the right amount of impact. Combine all of this with the latest coding techniques and advanced effects, and you have yourself one top-notch website! Read our blog detailing more information about the G-TECH build!